Ask the Readers: Is Organic Food Worth it? After watching The Meatrix (note the spelling), my wife has been on an organic food only tear. For those of you unfamiliar with The Meatrix and not inclined to watch, it’s about how poorly factory farm animals are treated to mass feed humans. Organic foods, on the other hand, have standards as to how animals/plants are treated and fed before reaching the human food supply. While it’s great that organic meats come from animals that are treated (and fed) better, they are also heavier on my credit card! How much more? Reviewing our grocery bills over the past couple of trips, it seems that organic products range from 30%-100% more than the same un-organic product. I would say that the price discrepancy may vary based on location, however since we are on an island, organic products sell at a premium. For example, a carton of large eggs here will cost around $2.85. A carton of large free range organic eggs will cost around $4.89. While the price difference of $2 (and change) may not sound like a lot in the grand scheme of things, it represents a 72% price difference. We typically drink skim milk which runs for around $3.77 for a 2L. The same amount of organic milk costs $6.10 which equates to a 62% premium. So here’s my question for you, is the benefit of eating organic food worth the price premium? Where do you draw the line when choosing between organic food and its counterpart? Still haven’t completely jumped on the organic train completely but I’m always looking for deals. A couple weeks back I found organic golden delicious apples selling cheaper then the “normal” ones at Fortinoes (Loblaws owned). You do need to be careful about ‘organic’. I don’t think there are true standards about what it means. I’ve read that ‘free range’ just means that a door must be open. That said, I’m a vegetarian, so I don’t pay that much attention to meat issues. I think your question hinges on the definition of “organic”. In fact, there isn’t one (at least that’s agreed upon by the food industry). There are companies that are doing a great job of producing quality healthy foods. Unfortunately I think more often the term is thrown about as a marketing term (much like “low fat”). As for whether or not it’s worth it, the question really becomes “how much is your health worth?”. Even further, “how much is the health of your kids worth?”. In my mind, it’s a simple question with a simple answer. I strongly recommend that if you’re serious about eating organic (in the way it’s usually interpreted by the consumer) you look in your area for a Community Supported Argriculture (or CSA or “crop share”). Get to know a local farmer (crops and livestock) and get to know what they grow/raise and how they do it. You can get a wide range of food for an affordable price (but yes, more expensive that your super-store-grocery). At the same time you get involved with your community. Organic foods also usually provide more natural flavour. Although we haven’t made the switch entirely, I believe it’s like everything else in life. Balance is the key. Organic can also be an important choice when changing to a more healthy selection of foods, but that doesn’t mean eating strictly organic foods will mean you are eating healthier. And buying organic foods will definitely mean a larger hit to your pocketbook. I think a lot of it is marketing bullsh**. The same way that every company is now “green” in some (small, insignificant way), a lot of food is marketed as organic or something close to it. As others have pointed out, there aren’t very good standards for this. I don’t agree with Peter’s logic “is your health worth it” – just because a company tells you their product is healthier doesn’t mean that it is. Another big factor for me is that while the “organicness” of a product might mean it is healthier (maybe even a lot healthier) than it’s non-organic equivalent, that doesn’t mean it’s good for you. I like red meat but I also know that it might not be that good for me if I eat too much – whether I eat organic or not, it might not matter that much. Another thing is your overall diet – does it matter that you eat a lot of organic food for dinner if you then eat a big piece of chocolate cake for dessert followed by several beers (organic?) while you watch the hockey game? Do you exercise? Are you overweight? My point is that regardless of the impact of organic vs inorganic? :) food most people (myself included) might be far better off eating better food choices (ie cutting out junk) and exercising more and losing weight. @Four Pillars – I guess I wasn’t clear. When I said “is your health worth it?” I was referring to truly organic foods (natural furtilizers, grown locally, crops rotated, in season, full vitamin content). I then tried to suggest that you go and talk to the farmer that actually grows your food so you can be sure about what you’re buying. As for the food that’s got the marketing department’s “organic” sticker on it, I say skip it. Not worth it. We buy organic produce on occasion when it’s local and in season and usually the same price as everything else, but I certainly don’t go out of my way to buy it. A lot of the “organic” products in Loblaws state that they are “organic certified” by a third party. Any ideas what that actually means? FP, I always look forward to your opinion on posts like this. :) But what if someone is already healthy with a balanced diet. Don’t you think that eating organic would benefit that person? We buy a lot (most?) of our fresh stuff from the farmers in St Lawrence Market, so are buying local whether organic or not. No melamine eggs from China! I’m more conscious of that than buying organic, which I do buy from time to time though. Money doesn’t come into it, we’re only two and we like our food, I’m not scrimping there. Also, the organic apples in the supermarket across the road from my office are often cheaper than the non-organic ones. Splain me that! I think that organic is a standard that isn’t clearly defined in the public mind, and that leaves them open to being taken advantage of. Like with the free range issue that only means a door needs to be open. Instead of paying a premium to major companies for ‘organic’ food, why not shop local? We should know where our food comes from, and so, get to know the people who produce it! Most cities have some form of a Farmers Market. Get to know these people, ask questions, find local Farms that produce chicken, pork, and beef. You may pay a bit more this way too, but I feel better about keeping that money locally. To me, that’s when a premium for organic food is worth it. Support your local farmers and businesses! You’ll be healthier for it and so will your local economy. But you really do never know. As one poster stated, “organic” (and “green”) is a huge marketing tool these days. Cash is, and always will be, king. Couple of things: organic meat is definitely worth it. If you are going to splurge on any kind of food, go for organic meat (and meat derivatives — milk etc). In Canada there is a greater amount of pesticides used/allowed on our produce (fruits & veggies) compared to other countries. You can make up your own mind on that. As an example, I get a mild allergic reaction from eating regular apples, but not from eating organic apples. All I can say, is that years ago, I grew a few veggie plants on my apartment balcony (with minimal care and attention) and they tasted far different than grocery store food — they HAD taste, they tasted REAL. It’s funny (and really screwed up) that “organic” is something special and set apart from other foods when organic is the way it actually is to begin with! FT – I honestly don’t know the answer to that since I don’t really know a lot about organic food or diet. However, I would think in that case it might help – but how much it will help and if it’s worth it? I don’t know. Intuitively, eating less pesticides and chemicals has to be better for you, my main quibble with organics is that I’m not sure how much of a difference some of them provide. Are organic bananas any different than non-organic? Another thing is that we are exposed to chemicals all the time – not just from our food. Even if you reduce your chemical intake from foods by a significant percentage – your overall consumption decrease will be less. Some food choices can help with the chemical intake – smaller fish have less chemicals than larger fish. Canned tuna when eaten in excess will raise your mercury levels. Perhaps some of you eat healthy & you debate if you should go organic or not, but I agree with FP that far too many should consider eating healthier overall before deciding to go organic or not. When you look at the overall population which consists of overweight people, I would say organic should be the least of there concerns… I know I can use to loose a few LBs, but I’m going in the right direction :-) . As an extra note, I know several people who eat REALLY healthy food (won’t catch me eating a lot of that stuff…) but the majority of people have no understanding of a proper balance. A simple example is that you bought yourself a really healthy cereal, but if you read the label most nutrition facts are based on 1 cup, pardon me for saying, but very few people take just 1 cup, maybe 2 or more & all of a sudden your healthy cereal is helping you gain weight. When I decide to learn something (like about finances) I tend to go a little overboard & that’s no difference when it comes to nutrition. I read till I was blue in the face, my favorite resources were “The Abs diet” (though I didn’t like the videos), the book made me understand a lot of concepts I wasn’t aware of, but my favorite was Body Building revealed (http://www.bodybuildingrevealed.com/) it was LONG and had WAY to much details (be nice if there was a shorter version) but it brought together all the little bits of info I had gathered. Almost all healthy approaches to loosing weight tell you to eat 6 meals a day (hard to do, but worth the effort) If any of you do try this stuff out, remember that knowing the path is a lot easier than walking the path. As a quick aside, and apologies for lack of details or info — I’ll try to find more, a few weeks ago there was a documentary on teevee (CBC?) about a Canadian woman. She went to the doc and they found over 100 toxins in her body. This freaked her out and she went across the country making this documentary to discover where all the toxins came from — basically heavy industry and food sources. She is also a vegetarian. It was interesting and disturbing. I’ll try and find out more. In the mean time, go watch ‘Super Size Me!’. its a marketing scam, if there is no active policing of a farm and its procedures, How do you know what you are getting is truly organic or the methods they claim in raising animals is truly followed. Do you honestly think the government has enough man power to regulate the farms. Although the comments are interesting, everyone seems to have missed the point made in the opening paragraph. “Is the benefit of eating organic food worth the price premium” is a question best asked of the animals who are being poorly treated. Most of us give lip service to better treatment, but are not much interested in doing anything to help if it comes out of our pockets. We don’t condone bad treatment to our cats, dogs, horses, etc., because we see them as our friends, we their protectors. Why should a calf or a lamb or a chicken (or their parents) be subjected to not only ill treatment but often torture so that we can save money? Wouldn’t it be better to eat half the meat and pay more for it so that the animals do not suffer? As a bonus, most of us would be healthier for it. I agree with most posters that Organic is quite a bit of marketing hype and due to lack of standards, everyone gets to call their produce organic if they do something different. In US we specifically looked for “USDA certified organic” for which a farm has to follow certain guidelines and verified independently. Haven’t found anything similar in Canada. That said, organic are definitely better in taste. Our milk and eggs are exclusively organic and because we consume a lot of it accounts for almost 40-50% of grocery bill. Now the big question: Is it worth it ? I can afford it, I have small kids, to me it is. My grandfather was a farmer and we grew up eating fresh and healthy food and I want to give the same to my kids. If ever cost becomes an issue, I am sure we will drop organic consumption to kids only. My body is well formed at this level, and we follow a healthy routine. $6.19 for a 4L of milk in NS. What a rip. Poster – you brought a great point that I forgot to mention. I would think that little kids would be harmed by excess chemicals more so than adults. While I don’t know if that is fact or fiction, it seems to make sense. Maybe buying organic for your kids is worthwhile. We buy a fair bit of organic fruits and vegies and I can tell you that the kids are the main reason. with all the scandal in this world, how can anyone be sure that what they are buying is ‘organic’. Who is actually regulating this and making sure..if Madoff and take $60B without regulation being enforced. I’m sure a non organic egg can pass as one. Otherwise, I would be all for it. Hard to trust any entity or company in todays world. It sounds cynical, but today it’s become reality. There’s lots of good wholesome food available that does not meet the standard to be called “organic” (of course my high school chem teacher would remind us that all food is organic….) simply because the producer can’t be certain of the inputs. For instance, the mice take the farmer’s non-organic pet food, and stash it in the cattle feed (hay bales) upon consumption, the beef is no longer organic. The use of a non-organic fertilizer prevents calling the product organic, even though the input has no real reflection on the concerns raised by many consumers. As said above, engaging local producers might well be the best way to encourage higher quality foods — so start with the Farmers’ Market & grow from there. Not if it ends up being full of maggots which has happened to me before. I refuse now to buy organic cabbage as you can’t tell from the outside. Bananas you peal away the outside thick layer so I don’t think it helps but things like berries that are hard to wash I really prefer to eat from my back yard. Much more flavor too. There is a free range chicken farm somewhat close to the city I’m in. Friends buy their eggs there all the time. But it is fenced in, they aren’t running in the grass but dirt and the food is just scattered in the pen. If stuff is sold here they do give antibiotics at least initially. Not sure if it’s a rule from the gov or not. Organic only is a waste of money. The “organic” label is still undefined and loosly applied. In Canada, the cost of a farm being truly organic (to be labelled as such legally) is ridiculous, so many farmers who practice ethical, natural techniques don’t go for the label. As for quality – I question if simply being “organic” increases quality. I think it’s more a result of the farmers involved putting more personal care into the product. Instead of machine-sorting hundreds of eggs a day, there’s more manual inspection involved, for example. You also have to look at how you prepare the food. If you’re hard-cooking eggs and grilling steaks well-done, then the quality increase of going organic is useless because the preparation ruins the flavour anyway. Do you really need organic milk to put on your fruit loops? If this is purely being done for an ethical reason, I suggest seeking out your local farmer’s markets. Most of these local farmers treat their animals well, minimize chemical use, and don’t play around with genetic modification beyond traditional selective breeding and the like. In fact, I find that most of the meat vendors at my markets follow the majority of the organic methods for raising their livestock, but can’t be bothered to pay the ridiculous fees or do the 1 or 2 minor things left to be labelled organic. Look for naturally raised food or do a little 1-on-1 research and you’ll save a bundle while still feeling good about your purchases. I think Astin has hit the mark. I have a close friend who farms and this year they hit the 10 year’s of fertilizer/chemical free farming milestone. That said, they still don’t meet the “organic” farming definition. I do believe its an ethical question more than a health question. Also, if you’re leaning green these days in some of your decisions, consider BullFrog energy at home for “green” energy. Well we may not be able to afford to buy a house in Vancouver but at least we don’t pay over $6.00 for organic milk…. Maybe its a placebo but I always found that the food we bought from the organic store tasted better…who knows though…. I definitely agree with Peter’s post. I made the choice last year to support local farms and enroll in a CSA. It was well worth the money. You receive a share of a farms harvest throughout the season. We received fresh produce weekly for about $25/week. The thing to remember is that even Organic or “Organic” farmers are running a business and some of them will bend the rules to make a bigger buck. There a lot of people who buy into the hype of it just like people eat up Hybrid vehicles etc. In the summer months we buy from the less fancy, less trendy and less expensive local farmers market here in Calgary (There is another one for Hummer driving “Green” soccer moms with produce from California) and pick produce from BC and Alberta and the prices are often cheaper than in the grocery store. We don’t buy specifically organic but you can tell from the taste that it is better for you. No – not worth it. I believe that we are exposed to my chemical risks throughout our lives. Its a bit of a funny trade off – regarding health – certainly incidences of cancer are on the rise – but this is partly due to a bias in that lifespan continues to rise – funny thing about longevity, if you don’t get cancer by about 70-75 yrs old, you probably won’t get it at all. Unrelated to food – new research is starting to suggest cell phones are bad again – but who’d be willing to give theirs up? If you really were looking to eat the most healthy produce – grow veg’s out of your backyard – extra tasty as everything reaches full flavour right before you eat it, saves you money. Need eggs? Lots of municipalities are relaxing by-laws preventing keeping chickens in your yard. Walking in to the big box supermarket and buying “Organic” is most often just paying more for something that isn’t intrinsically different than the non-organic items an aisle over. It is barely regulated and a lot of big producers have found loopholes to stamp their items with the pretty looking Organic stamp and get away with charging twice as much for the same item. As stated numerous times above, buy local if you wish to truly verify your food to be Organic, know who is producing your food and see for yourself that they are following the rules that you expect… otherwise you are just wasting your money. FT, I had the same problem as you – how to reconcile health benefits with cost, the lack of universal standards/definitions etc etc. So I did some digging to determine which grocery items are the most beneficial to buy organic. i.e. organic maple syrup is really just maple syrup, but organic hormone-free dairy should be far healthier than ‘regular’ milk. For fruits and vegetables, there are charts available that rank items based on pesticide residues (how often samples had detectable pesticides, ppm, etc). This can help you get the most bang for your buck in terms of splurging on ‘organic’ foods. Also, organic fruits/veg often look different – not so giant-sized, and like previous commenters said, taste different. You can buy one fruit that is organic/non-organic for a side-by-side taste test to verify this. Wow, this topic sure sparked some debate. The fact that it costs more to treat the animals better in lifestyle and in their diet probably speaks volumes as to what you are getting when you buy non organic food. If you can afford it and it doesn’t bother you then buy organic. If that is not the case then don’t. Nectarines, Celery, Pears, Peaches, Apples, Cherries, Strawberries, Imported Grapes, Spinach, Potatoes, Bell Peppers, and Raspberries. Asparagus, Avocados, Bananas, Broccoli, Cauliflower, Corn, Kiwi, Mangoes, Onions, Papaya, Pineapples, and Sweet Peas. For other produce, think about whether or not the edible part is exposed. Generally the pesticides just coat the exterior and don’t get absorbed very easily, but of course there are exceptions. Something I’ve always wondered is how harmful the different kinds of pesticides are? There’s probably some that either don’t harm humans at all, and some that your body gets rid of easily. And on the flip-side, some pesticides may be quite dangerous, especially to children, even though Health Canada and the FDA try their best to screen these out. I guess it doesn’t really matter since you can’t really find out what’s being used on your non-organic produce. Personally, I just buy whatever is cheapest, and I always ALWAYS wash my fruits and vegetables. The OPR (Organic Product Regulations) will be effective June 30, 2009. I also agree with FP. Eating organic is on thing but you also need to exercise, eat the right amount of the right food. Also all not organic products have the same value. Organic bananas are meaningless to me on a well being stand point as you peel them (at least I do). Organic potatoes on the other hand will not grow in bath of pesticides. Some products have more toxins than others, it’s up to us the consumers to decide which ones make senses. It’s about finding the right balance for you and your family. Elbyron, I understand what you and others are saying in terms of the pesticide residues, etc., that are in different fruits and veggies, but keep in mind that the impact of the pesticides are not only on the consumer. In particular, bananas and other tropical fruits are often grown in countries with very little protection for the local environment or the workers who are tending and harvesting the crops. So there are definite health impacts to those people, as well as contamination of local water and soil and loss of biodiversity, etc. Just another factor to keep in mind as you weigh whether the cost is worth it. And yes, pesticides vary in their toxicity but a lot of the older ones don’t break down and concentrate in your reproductive organs and fat cells (later coming out in breast milk) as well as hanging out in the environment and travelling all over the world. Also they are designed to kill living things, so you can pretty much count on the fact that they’re not good for you! A big argument against organic is without the various chemicals used to increase yield, the more people to switch to organic foods, the harder it is to feed our population with a finite amount of agricultural land. Other issues arise such as considering genetically engineered foods as non-organic. Genetic engineering does not mean people injecting chemicals with with syringes into plants. It can mean as little as selective breeding of crops to lab manipulation of seed crops. Some people don’t want chemicals sprayed on their food. Some people don’t want crops that aren’t naturally bred. Where do we draw the line? Also, regarding “free range” eggs. Look at the farm it came from. It’s probably < 100 km from your home. When it’s January and there is 4 feet of snow in the field where do you think these free range chickens are? That’s right, they’re penned up in the coop. It’s probably a slightly larger coop than the “normal” chickens get but don’t be confused about chickens peacefully wallowing in the field. “Organic” is a marketing tool, pure and simple. Saying “organic” is good and “chemicals” are bad is ridiculous and paying more because someone tells you this is ludicrous. Blanket generalizations like these serve no purpose. If chemicals are bad why eat fruit? They’re full of them, vitamins, amino acids, its just down right scary! If you want to increase your health and reduce your exposure to high levels of toxic chemicals, then moderation (in diet, in lifestyle), a balanced diet, and exercise are key. Eating locally, in general, is good as it reduces auxilary production resources, but if you live next to a nickel mine it doesn’t hold true now does it? Everything must be qualified to your specific situation. Hello everyone. For many people who buy organic, the value isn’t only human health, it’s also the health of the planet. It’s always possible to distribute finances according to our values – and they don’t always have to stay the same! We’ve been buying all-organic for about 20 years. On the personal level, we reduce the influence of toxic chemicals introduced into our bodies. How much is that worth? Well, to each their own. On the broader level, chemical fertilizers have left topsoil effectively dead, effluent runs off into lakes and streams and gets into the food chain, etc. Information about this context is out there and easily and freely available. It’s made an impression on me. As for population, it’s important to consider that it’s not just numbers of people, but those numbers consume. It won’t come as a surprise that North Americans consume many times more of every kind of product, including food, as the average person living elsewhere, and who are not in the extreme position of starvation or discomfort. But now people in developing nations, who have enormous populations compared to ours, want to live like we do. Well, no technology can cope with that looming demand. Organics produce less, on a varying basis per crop, but the drop isn’t overwhelming. The trick seems to me to involve maintaining or increasing local production, rather than shoving more chemicals into the soil of massive farms to ship half way round the world. It’s kind of common sense, really. Many posters have remarked about organic labels being meaningless because it’s just marketing and/or the organizations aren’t monitoring the farms. I respect skepticism – it’s always a good thing. So far though, these remarks haven’t come with supporting sources. With respect, I don’t see a reason to accept those opinions any more than accepting unsupported opinions about financial matters. What we need to look at is consistency, not anomalies. When there’s a bias, there’s a tendency to find relatively infrequent problems and use them to bash the whole idea, no matter what the subject is. Or to hold an industry to a perfect standard, instead of seeing it as a work in progress. Where I do share concerns with a lot of the posters is with the retail end of things. When Whole Foods bought out our local organics chain here in Vancouver, I expected prices to reduce at least a little due to economy of scale. Well, that’s not happened – and I resent what I consider price gouging. So at least with produce, I support buying at the local farmers’ markets, where my money goes direct to the farmer, not to a big-box retailer. For meat, I use a butcher specializing in free-range and/or organic meat. For fish, I use a fish-monger. Big box stores don’t offer anywhere near the service or the expertise or the connections to local producers like these folks do. For some products it’s impossible to avoid the big box, but that’s life! Cheerio – great site, by the way! Edited to remove a double post – I must’ve hit the return twice for emphasis! Organic food is just the beginning for our family. You wouldn’t believe what we spend on diapers. Organic = not worth the premium. Unless it is on sale for less than the on sale non-organic (yes it does happen, ….sometimes). As for the treatment of animals. It is important..to a degree. The guilt is only in your mind. I.e Last year we bought a 1/4 cow, pasture fed non-hormone injected. Overall, it was actually cheaper than meat at the store. Tastes the same, and alleviated my ‘guilt’ for eating meat. We even got ‘introduced’ to the cows, about 20 of them, and the farmer pointed out the one that would be next. A bit morbid and a bit funny, them being oblivious and all. If I was a cow I’d like to go that way…eat well outside, frolick with other young cows (wink), wander about, and then in the end meat new people. I haven’t done organic yet. Isn’t it what matters is the end result, the food? I imagine the food chain should come into play here. “Is Organic Food Worth it”? I would say it depends. For me organic = health. If you are taking organic food and you drinks alcohol, you smoke and you maintain bad life style. It is pointless for you to take organic food. I would say it is wasted. Vice-versa if you are taking organic food and you don’t drinks alcohol, you don’t smoke and you maintain healthy life stay. Even you spend 200% extra on the organic food I still find it worth while. I think so, yes. But the definition of organic should be taken carefully and in the context of the overall lifestyle. We cook our meals, limit eating out & that morning coffee, and instead concentrate on healthy food preferably grown by people we can speak with. It really isn’t that tough – we live in the city and our friends are not mostly farmers. But we have formed relationships with local producers who can supply coffee, meat, vegetables, fruit, jam, honey and baked goods. We pay what they ask and we eat ALL OF IT. Our grocery bills are high, particularly in comparison with the fortunate inhabitants of places like Vancouver, but they are not exacerbated by us throwing any of it away. Have we noticed a difference? Not always, but yes, we have. For example, we tried organic milk, which here in Calgary costs roughly twice that of regular milk. Instantly, we noticed a decrease in ailments we always thought were lactose-intolerance-related. If our side effects were not being caused by lactose intolerance, then what the heck is in regular milk that causes gas, diarrhoea and bloating?? I shudder to think. And I do agree with the overall thought that eating organic is only worthwhile in the context of lifestyle. If that lifestyle includes tobacco products, illegal drugs, heavy liquor consumption, fast food and all-day coffee, then I would say that the easiest and cheapest route to better health would be to address all that low hanging fruit before spending extra on organic tomatoes. @eazypz: Asking for sources is great (others gave them, the NY Times is a great artible). However, don’t you think its strange that you require sourced evidence from random internet posters who have no vested interest in what you do, yet are okay believing corporate marketing whose sole purpose is to part you from your money w/o even questioning it? There is a reason industry has latched on to the word “organic” and uses it to label so many different things with so many meanings. In common use “organic” has positive connotations. That doesn’t necessarily mean the product does as well. Caveat emptor as always. This post has definitely highlighted some readers who obviously care about money and only money. Organic is worth it if it is on sale? I think you’ve missed the whole point here…. One solution that I advocate is to reduce your meat consumption – either by a bit or up to 100%. Try reducing to 3 portions a week. Check the Canada Food Guide. You might be shocked at what a ‘portion’ is. Reducing your meat consumption will likely save you money. It will also lessen your environmental impact, avoid the killing of those animals, and reduce the growth hormones that you are likely eating. Win, win, win. If everyone on Earth lead the average North American lifestyle which includes a North American diet and thus copious meat consumption, we would require 6 Earths to support us all! Global starvation right now is not a problem of insufficient land, it’s a double problem of a few people using most of the resources and an inability to transport food from where it grows well to where there are mouths to feed. Simply – reducing meat consumption reduces the number of Earths we would need because cows are about 10% efficient at turning vegetable calories into meat calories. I think it’s worth it, but, as with everything, it’s important to be an informed consumer. It’s a time investment, and it’s worth doing for many reasons people have mentioned in comments. When we first went 100% organic, our bills were much higher than they are now. As time has gone by, we figured out the system. For example, it is much cheaper as well as better for the planet to buy free-range eggs (from organically fed chickens) locally (our sources are our farmer’s market and our independent butcher.) Eating seasonally, buying in bulk, eating less meat, growing some things (esp things that are pricey at the grocery- organic berries, shallots, things like that), getting the deep freeze, cutting back on anything in a box, joining our CSA have all been ways to mitigate the higher cost of that initial choice. It has taken years, but you know what? Our lives are improved, and it has been a meaningful process of discovery for our family. I have to say organic food is worth it. How much do you care about your health and what you place in your body? I am starting to be a total health buff about food and my body so if I can get everything organic I would. That’s a great comment, EmilyCatherine. tetsuo69, if I’m interpreting your comment correctly, you assume that I “believe corporate marketing…”w/o even questioning it.” I’m not sure why you think that I don’t question it, but I sure do! I’m very aware of corporations’ tendency to misuse words like “organic,” “green,” “sustainable,” and so on. But resources to help stay educated are readily available; all it takes is the investment of time. For example, to understand the process of organic certification in Canada, people might want to start with the Canadian Organic Growers site. A distinction needs to be made: I’m unquestioningly in favour of organic farming, but I’m skeptical of all marketing. Government regulations are very specific about labeling requirements – and there are some worthwhile changes to them coming in June. I think it’s reasonable to be vigilant, but not cynical. It’s no good throwing the baby out with the bath water when one discovers that a system isn’t perfect. Anyone ever seen the Simpsons episode where Homer goes on a tour of the Duff beer factory? The factory production line has 1 pipe going to 3 vats of beer; Duff, Duff Light, and Duff Premium (don’t exactly remember the names)…. Anyhow…thats exactly like Organic food. You will never really know if its the same stuff packaged in a different way, then being called ‘organic’. Is organic food worth it? Depends what your priorities are. I choose some organics, but not everything. One of my main reasons is not for the residues on the food, but to reduce all the fertilizers and pesticides that enter our water supplies. Which we in turn drink, or eat fish from. I only buy organic milk for my toddler based on the logic that most toxins are fat soluble and since he is still drinking 3.25% milk, more fat, means more toxins. Now there are still ways to save. Check with local farmers. If you live even close to a rural area you can buy a doz. eggs for $2 from their door. They might not be technically organic, but you can see for yourself how they are raised and make the choice. And of course take advantage of local produce and freeze or can it during peak season and enjoy all winter. Tasty and you can save $ at the same time, just need to put a little effort into it. I def think the thought organic is worth it, if for nothing else to stand up for animal standards and reduce pollution of our waters. If money were not an option I would buy more organic, so until that time I pick and choose what is most important. Some things like dairy and meat are high on my list because of all the hormones that are involves that have immediate effects on our bodies. Vegetables and fruit haven’t made it there yet. I do give them a good washing but I just can’t afford it. I hate to say it but I also avoid food originating in China. I am not sure that the food inspection standards are what I would like them to be. Until the “Organic” world is better managed, supervised and standardized, I believe that the prices we’re paying is just a big hoopla and nothing else. My father and uncle are farmers. They run an anaerobic digester and create power for 300 homes using manure and grease trap organic waste. Of course they use the processed manure for fertilizer (all bacteria, pathogens, weed seeds and methane gases are broken down/killed so this is a much healthier fertalizer then straight unprocessed manure). Of course this is not considered ‘organic’. The milk cows also are not ‘organic’ but this farm has consistently won prizes for the milk being cleaner then the farms around. (Did you know cows lie down in their straw beds and dirty their teats and they are not wiped by most farmers before the milk unit is applied?) Well my dad of course does that. ROFL Mark.. white eggs come from white chickens, brown eggs from brown ones. 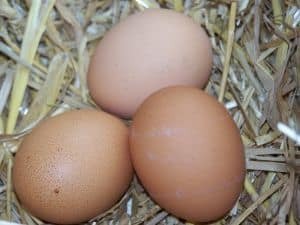 The egg color has NOTHING to do with what the chickens are fed… I can’t believe how gullible people are. I disagree with your analysis of global starvation being an issue of a few people using most of the resources, and an inability of being able to transport food. I’m pretty certain is more of a political issue of local corruption and oppression. Also, there is a huge amount of science going into the feeding of cows to improve the efficiency in producing both milk and meat. Not to mention a ton of research into using all the other products that cows produce so as to increasing improve the overall efficiency of cows. I also think the whole 100 mile diet thing is bunk. It’s simly not possible in calgary. I would be limiting my family to beef, chicken, spinach, arugula, eggplant, chard, red peppers and cukes. Tomatoes around here are all produced in energy intensive greenhouses. In winter, potatoes, beets, rutabagas, parsnips and carrots. No fruit or fruit products other than strawberries or saskatoon berries. Fish? I wish. Also, not to mention all the economic damage we’d be doing to all those peoples in places like Costa Rica where all your banana’s come from. Or all the fruit produced in BC in the summer? Think local, buy local is a very bad policy in the global economy, and I believe it does far more harm than good. All it will accomplish is local starvation in one place, and local waste in another.